I’m a fair weather fan. I’m not proud, but that’s how it is. For example, for many decades my last memory of getting excited about baseball was when the Chicago White Sox won the pennant in 1959 (okay, I’m old). Along those lines, I used to think I didn’t much like white wines. The words “sauvignon blanc” pretty much made my mind go blank. I spent many years in comfortable ignorance. But it’s been a long time since I tested white wines, and things seem to have gotten a lot more sophisticated since I last paid attention. Morro Bay (Split Oak Estates) 2009, California. Light, crisp, bright and dry. Delicious served with rich, double-cream D’aufinois cheese (like Brie with pepper). Winemaker says vanilla and pineapple, and here’s the rest. La Petite Perriere 2011, France. Dry, rich, well-blended with perfume-y fruit notes, almost oaky like a chardonnay. Winemaker says ripe exotic fruits, refreshing and complex, and here’s the rest. 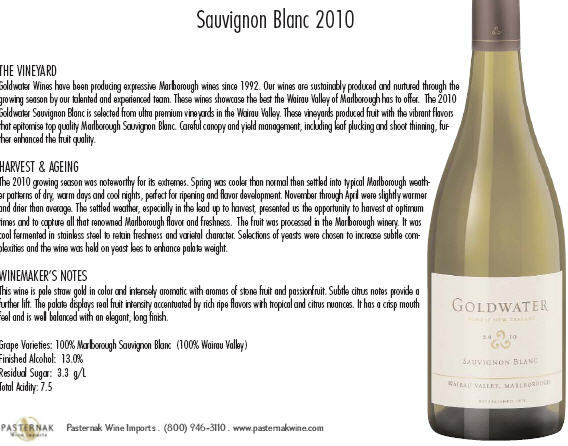 Goldwater Sauvignon Blanc 2010, New Zealand. Creamy, soft white, a bit less astringent than some sauvignon blancs. Gentle and flavorful. I could easily drink this every summer afternoon and convince myself the rest of the tasks on my agenda don’t matter. Winemaker says rich, ripe fruits and crisp feel, and here’s the rest. Jaja Sauvignon Blanc 2010, France. Crisp, pleasant, light. Winemaker says flowers and blackcurrants and zesty, and here’s the rest. Los Vascos 2011, Chile. Smooth, rounded, full-bodied, great with food. Tastes good even with sweet ‘n’ sour dishes. No kidding-I drank it with a meal that included pickled beets and vinegar-dressed slaw! A winner. Winemaker says fruit, spices and persistent, and here’s the rest. Lafite Reserve Speciale Bordeaux Blanc 2010, France. Very smooth and rich. Blend of Semillon and Sauvignon grapes yields rounder flavor. Winemaker says vivacious, full and balanced, and here’s the rest. Merlin’s Barrow Sauvignon Blanc 2009, Marlborough, New Zealand. Crisp, light, drinkable. Good with light and/or spicy foods. Winemaker says star-bright, green-hued wine leaps from the glass with passion fruit, grapefruit and pineapple perfumes and here’s the rest. (As of this writing the half-case sale on this link is expired, but look for the winemaker’s notes lower on the page).